“It was one small bite for man, one giant leap for #nasaveggie…”, he stated. He was referring to the experiment Veg-01, whose goal is to develop sustainable food sources in space using a “gardening kit,” called Veggie. The objective was to grow lettuce in mini-greenhouses under LED lights. This would be a veritable holy grail for astronauts for whom fresh food is scarce, and even more so for those on long missions, such as the expedition to Mars planned for 2030. If space agriculture is making big headlines today, it is because what astronauts consume—beverages like Tang or pureed meat and chocolate paste in toothpaste-style tubes—is a topic that still resonates with the public. SIAL digs into NASA’s ISS cuisine to learn a bit more. It’s not so easy to eat in space. There’s the challenge of eating while under the effects of microgravity, the strategic issue of stocking and preserving food, and, of course, the sanitary requirements. With all these considerations, culinary inspiration comes more from military MREs (meals ready-to-eat) than fine dining! The menu features dehydrated, thermally stabilized and intermediate moisture foods—and sometimes even irradiated foods, such as dehydrated ionized meat. It’s not surprising, then, that since the first Mercury manned spaceflight, NASA’s food research has been focused on flavor. The Mercury era produced the first space meals. They came in bite-sized cubes that could be re-hydrated with saliva, and semi-liquid foods packaged in toothpaste-style aluminum tubes, like the one which John Glenn famously ate applesauce from aboard the Friendship 7 spacecraft. NASA became one of the first consumers of freeze-dried products when it adopted this technique for the Gemini program. But it was Tang, the famous sugary, fruit-flavored, non-carbonated, and freeze-dried beverage that finally brought NASA’s space food to the attention of the general public. Tang addressed the challenges of preservation, volume, and weight that these space voyages faced. As the space programs progressed, it was packaging techniques that made a greater variety of products possible. The Apollo program saw the advent of a flexible, heat stabilized packet that, unusually, didn’t require extra water for re-hydration. Aboard Skylab, the onboard equipment was even better, and included a freezer, a refrigerator, a table, and a hot plate. However, space exploration’s cuisine does more than just conquer far-off lands; it meets the specific requirements of our planet. One of the main issues with eating in orbit is limiting waste and providing the nutrition necessary to prevent muscle damage and calcium and vitamin deficiencies—all the while trying to limit the amount of land, water, and energy resources needed. These challenges have inspired experts in molecular gastronomy to experiment with weightless cuisine. One such experiment was carried out recently by the Michelin-starred chef Thierry Marx in collaboration with the French National Center for Space Studies (CNES). Aboard a Novespace Airbus A310 zero G, he created a product that was light, edible, biodegradable, and made of seaweed and water. “[…] tapas like deconstructed mission-flown LED-lit slaws” (source: Slate). These days, space cuisine is focused on the future of food. 3D printing could solve the problems of quantity management, hunger, and food waste throughout the world. 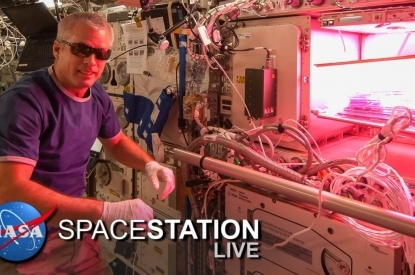 Space agriculture is also working towards dietary self-sufficiency in hostile environments. Hydroponics and techniques for photosynthesis are currently being explored. Since 2013, NASA has been making major headlines with its investment in the 3D printing project run by Anjan Contractor, an engineer and entrepreneur. 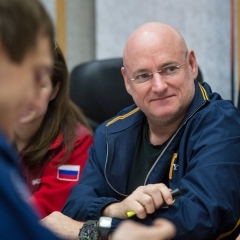 His goal is to make automated food production available on long-term space voyages. He tested his prototype by making pizza. The three-dimensional printer works by building up successive thin layers of edible powder rather than ink. “The cartridges (of powder) will have a lifespan of 30 years, more than long enough to enable long-distance space travel,” The Verge explains. Anjan hopes to take the project even further by using it as a tool to deal with the food shortages caused by increased population density.